As we crawl ever so close to October, the month of witches is near. With film favorites like Hocus Pocus, television shows like Salem, and books on nice witches, evil witches, and every witch in between, the bewitching hour is soon upon us. 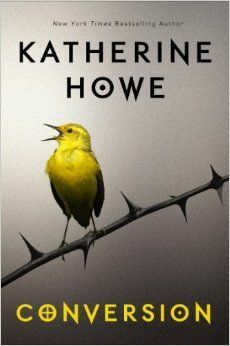 There's no better way to get into the Halloween spirit than by reading Katherine Howe's mysterious Conversion. Playing off of The Crucible, the classic play that every American literature teacher includes in her syllabus, Howe's story takes us back and forth from Salem Village's Ann to 2012s Colleen. Senior year for any student is challenging: rigorous classes, scholarships, and college applications, SATs, etc. There' s no wonder students get senioritis by December. For Colleen at St. Joan's Academy, the premiere, exclusive, Catholic high school, getting into Harvard is her #1 priority. Amidst chaos of trying to be valedictorian, Colleen begins to notice something strange at school. First, Clara Rutherford spontaneously begins to convulse in class, leading to a mysterious illness that overtakes the most popular girls at school. For each girl, the illness materializes differently. For one, she loses her hair, and for another, she coughs up fish bones at least once a day. As the illness spreads, so do the rumors, from chemicals under the school to PANDAS, an unheard of disease. Only Colleen suspects something more. While Colleen tells her story, Ann provides her version of events in Salem Village with a confessional account of faking being spelled with other girls such as Abigail Williams. Her tale cleverly parallels Colleen's modern day account, so much so that it's really obvious what's going on in Danvers (present-day Salem). Colleen Rowley is your typical high school teenager, obsessed with her cell phone, her boyfriend, getting into the best college, and hanging out with friends. Only when she's pushed by her substitute AP US History teacher for extra credit does she begin to develop a less-selfish character and try to figure out what's happening to her friends. Ann is a much more believable character, and you can easily sympathize with her desire for power in a male-dominated society. The plot begins furiously with the first illness occurring rather quickly, and Ann's account connecting the two worlds, but about halfway through, the same plot of girl-getting-sick continues, and nothing really happens. I found myself skimming through several chapters just to see new developments. I enjoyed the parallels to The Crucible, but after awhile, the connections became too apparent, and the mystery dissolved. A modern day spin on Salem witches and a fun read, to a point.